It is possible to integrate CCTV signals into either an existing or new communal television system, enabling residents to see each camera as an individual channel on their television set. This option is especially popular with vulnerable residents, who are able to verify the identity of callers on their television screen. 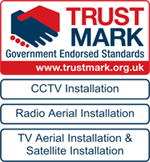 We can also convert the CCTV signal to a Freeview channel and display it on a selected channel on the EPG (Electronic Programme Guide) giving you quick and easy access to any selected CCTV images. Please call us on 01892 725 831 for further information.